Possibly the best cover fire blaster on the market right now. In today’s fast paced blaster scene, rate of fire is everything. Owing to the inaccuracy of most of the darts, you’re better off firing a quick flurry of darts for a confirmed hit than shooting one shot hoping it wouldn’t veer wildly off the target. 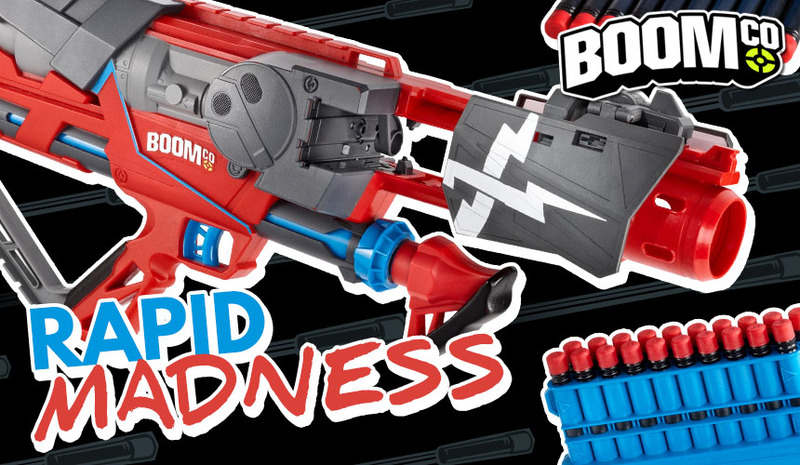 Enter the Rapid Madness, BOOMco’s debut flagship blaster for 2014. 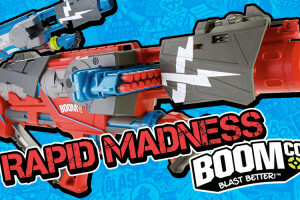 With an insane rate of fire, and high modding potential, it has become one of the fan favourites in the blaster community. Let’s check it out! Now I know that this section is kinda obsolete, but it represents how BOOMco is presenting it’s products to the people. When I walk into a toy store, the product needs to catch my attention, and I must say, BOOMco’s packaging is pretty sweet. A big box(about 30 inches across),open-faced, lots of panels sticking out, a good mix of black and red, count me impressed. Now a few things that got my attention are the decreased range claims(45 feet rather than 50 feet), lack of the BOOMco round, and the new way of opening the box(there’s a panel on the back side that you rip off.). This leads me to believe that this is a second generation, Asian release of the Rapid Madness(the instructions were in Mandarin, Japanese, Malay, Thai and English). 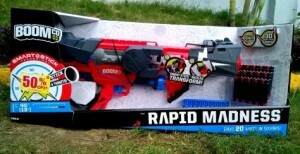 Because Asian countries do not have any restrictions on toy blasters, I wonder why was the range decreased. We’ll see that in the range test. 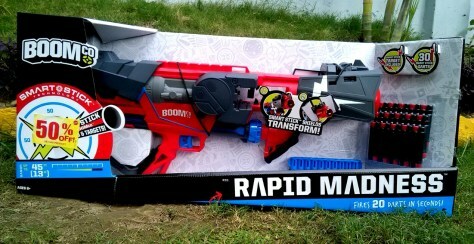 In a word, the box looks fun, and so does the blaster. 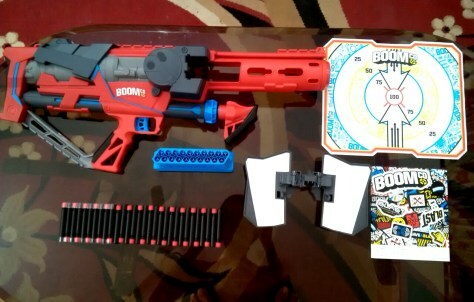 Inside the box, you get the Rapid Madness, a 20 dart clip, a smart-stick shield for the blaster, 30 darts, a 12×9 inch smart stick target and a few stickers(which I really like). The target has an adhesive backing so that you can stick it where you want to. Once fully assembled, the blaster feels adequately sized for adults and kids alike. The handle feels nice in my big hands, so I see no problem for kids in holding the blaster, although I guess it’ll be a tad bit heavy for them. The embossed logo, matte paint finish and the unique coloring adds a unique look to the blaster, one not found in Nerf blasters. The embossed logo, matte paint finish and the unique coloring adds a unique look to the blaster, one not found in Nerf blasters. From an aesthetic standpoint, it’s pretty decent. The skeletal handle is comfortable enough and the pump grip offers a natural place to hold the blaster. However, the back of the grip area needs a little refinement. The indentation where the thumb rests rises sharply and often rubs against my knuckle, making it sore. Now another thing that can be an issue for younger players is pumping the blaster. I took a few measurements and found out that on full draw, the distance between the pump handle and my shoulder was 29 inches. So make sure you can pull the pump handle far enough. Also, the last few pumps requires some effort to be pumped,. That might not be a problem for an athletic adult like me, but it might be an arduous task for the kids. To fire the blaster, pump it 16 times(the over pressure release valve kicks in at 18 pumps), load the clip, and let it rip. I fired the blaster 3 times from shoulder height, parallel to ground and 3 times angled to ground, at about 30 degrees. I also counted the number of shots landing in each category based on range. Given below are 2 tables, which are the average of 3 parallel firing tests and 3 angled firing tests respectively. Again, the blaster was fired three times, and an average of three variables is given below. time was measured from trigger pull to last dart fired. From 25-30 feet in a closed environment, I found 9-10 inch dart groupings when fired flat (thanks to smart stick). Darts tend to stay down the line when the shot is angled, owing to their better dart design. Accuracy might not be what the manufacturers were aiming for, but its way better than any Nerf blaster. I have to say, these smart stick darts, they stick, and they stick good. 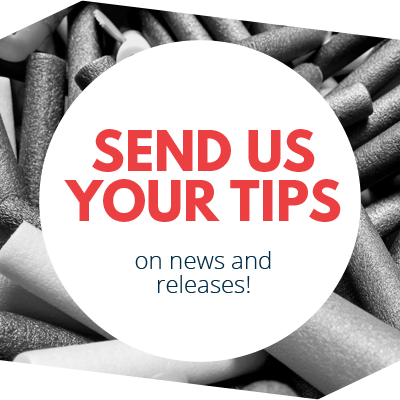 BOOMco darts are well designed for flying through air, due to their low weight, optimal weight distribution and just better aerodynamics than Elite darts. 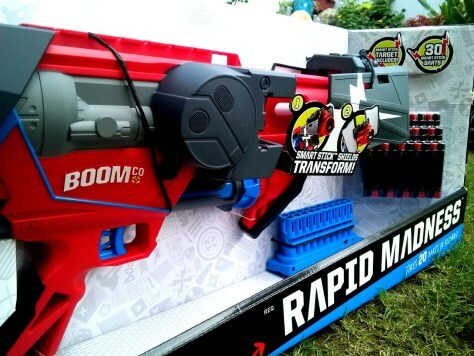 I have to hand it to BOOMco, for their first attempt at making a blaster, this is pretty cool. The Rapid Madness does what it’s meant to do, and that is obliterate. The rapid fire flurry of darts(which is faster than 1st Gen. models) is just impossible to dodge, the darts stick extremely well, and the blaster lives up to it’s range claims, which is a first for me. Also, modding the blaster is as easy as it gets, just loosen the loosen the screw on the shoulder stock, and done. It delays the kick-in of the OPRV and thus gives more air volume to the blaster, you would be able to run through a 40-clip easily. Overall, I’m impressed with this blaster, if not completely sold. There are a few kinks to work out, but that can be overlooked when you have a blaster this good. The Rapid Madness is indeed, the one to pick. 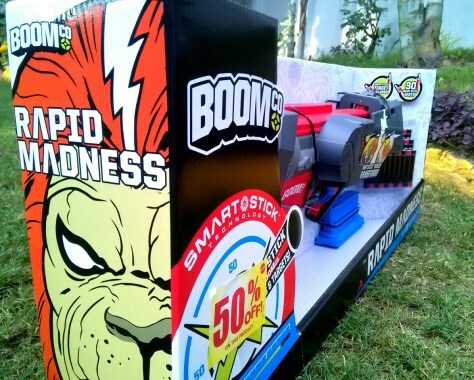 This entry was posted in Dart Blasters, Reviews and tagged boomco, rapid madness on January 11, 2016 by Stryker450. 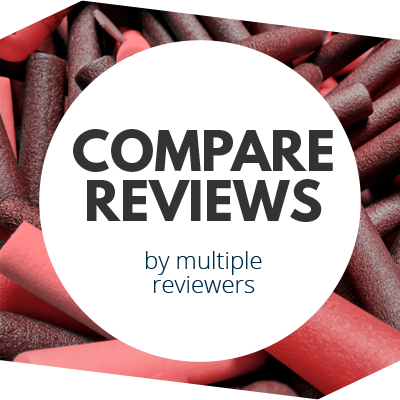 This was a very thorough review…makes me wonder if the reviewer really has anything better to do..